ecobee is a Canadian home automation company that makes thermostats for residential and commercial use. The thermostats are controlled by using the built-in touchscreen, using a registered login or using a companion app available for iOS, Android and the Apple Watch. The ecobee4 is ecobee's flagship product which was originally launched May 3, 2017. It is a touchscreen thermostat that works with up to 32 remote temperature/motion sensors to adjust the thermostat based on where you are. It also has IFTTT integration. An updated version of the ecobee3 was released in 2015 that works with Apple HomeKit. The ecobee3 lite was released on October 17, 2016. The ecobee3 lite is a less expensive thermostat that resembles the ecobee3, but does not include any remote temperature sensors. Support for remote temperature sensors was added to the ecobee3 lite in March 2017. On May 3, 2017, the company announced the unveiling of its 4th-generation product (ecobee4), which includes built-in Amazon Alexa Voice Service. The ecobee4, ecobee3 (and lite) allows the user to set different schedules each day for various modes, including home, away, and sleep. The remote sensors detect temperature and occupancy and can engage a Smart Away mode if no movement is detected. The ecobee3/4 integrates the remote sensors by controlling to the average room temperature for all sensors that are included in the mode setting (and detect occupancy, if enabled). A vacation mode can be programmed for extended times away from home. With this smart thermostat, you can set convenient reminders for HVAC maintenance, Furnace filter replacement, UV Lamp replacement, as well as alerts for Low Temperature, High Temperature, Low Humidity, and High Humidity. Switch+ is a smart light switch announced in May 2017. The switch has a microphone with built-in Amazon Alexa, along with occupancy and daylight sensors. It was released on March 26, 2018. Ecobee was founded in 2007. It has been recognized with a number of awards, including the Deloitte Technology Green 15 Award for Canadian green technology companies, and the 2011 AHR Expo Innovation Award in the category of building automation. In March 2018, ecobee raised a CA$80 million series C round of funding. Ecobee products integrate with: Microsoft's Cortana, Amazon Alexa, Apple HomeKit, Google Assistant, Samsung SmartThings, Wink, Haiku Fans, IFTTT, Logitech Harmony, Vera, and Control4. Ecobee uses an open API for additional integration options. ^ a b "About". Ecobee. Retrieved 2018-06-18. ^ Dow, Georgia (June 4, 2015). "Using the Ecobee3 Wi-Fi thermostat with your Apple Watch". iMore. ^ a b "ecobee Launches ecobee4 Smart Thermostat with Built-In Alexa Voice Service". www.businesswire.com. Retrieved 2017-05-03. ^ Wollerton, Megan (September 30, 2014). "Ecobee3 Wi-Fi Smart Thermostat review". CNET. ^ "Ecobee3 Smart WiFi Thermostat". PC Mag. January 26, 2015. ^ "IFTTT integration comes to ecobee!". ecobee. ^ "Introducing the ecobee Channel". IFTTT Blog. ^ Clover, Juli (June 2, 2015). "Ecobee and Insteon Announce New HomeKit-Compatible Products". MacRumors. ^ Kahn, Jordan (June 2, 2015). "Here comes Apple's HomeKit, first products start shipping starting w/ Insteon, Lutron, iHome, Elgato and Ecobee". 9to5 Mac. ^ Cooper, Sean (17 October 2016). "The Ecobee3 Lite is a decent smart thermostat that costs less than most". Engadget. Retrieved 21 October 2016. ^ Wollerton, Megan (17 October 2016). "Alexa, Siri, IFTTT: This smart thermostat works with 'em all". CNET. Retrieved 21 October 2016. ^ "Does ecobee3 lite work with room sensors? | Smart WiFi Thermostats by ecobee". www.ecobee.com. Retrieved 2017-04-25. ^ Gibides, Justin. 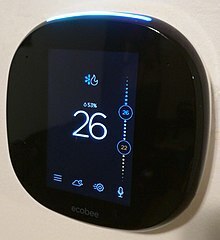 "Ecobee4 thermostat". ecobee.com. ^ "Ecobee debuts energy-saving, WiFi-connected Smart Thermostat". Engadget. Retrieved 2017-05-01. ^ Clarke, Steph (January 23, 2012). "Smart Si Press Release" (PDF). Ecobee. ^ "Introducing ecobee3 with Wireless Remote Sensors | Smart WiFi Thermostats by ecobee". www.ecobee.com. Retrieved 2017-05-01. ^ "HomeKit-enabled ecobee3 | Smart WiFi Thermostats by ecobee". www.ecobee.com. Retrieved 2017-05-01. ^ "Connected Home Leader ecobee Launches New ecobee3 lite Smart Thermostat | Smart WiFi Thermostats by ecobee". www.ecobee.com. Retrieved 2017-05-01. ^ "Does ecobee3 support wired remote sensors? | Smart WiFi Thermostats by ecobee". www.ecobee.com. Retrieved 2017-05-01. ^ "How many wireless remote sensors can you support on the thermostat?". ecobee Support. Retrieved 2017-05-01. ^ Hall, Zac (21 November 2017). "ecobee launches pilot program for its Alexa-enabled Switch+ light switch ahead of release". 9to5Mac. Retrieved 24 January 2018. ^ "Ecobee announces smart light switch with built-in Alexa and numerous sensors". AFTVnews. 4 May 2017. Retrieved 24 January 2018. ^ "Ecobee's Switch+ Alexa-enabled light switch is now available for pre-order in Canada". MobileSyrup. 2018-03-13. Retrieved 2018-03-14. ^ "Company Overview of ecobee, Inc". ^ "ecobee Receives Coveted 'Technology Green 15(TM)' Award at the 2011 Deloitte Technology Fast 50(TM) for a Third Year in a Row!". ^ "2011 AHR Expo Innovation Award Winners" (PDF). ^ Kolodny, Lora (7 March 2018). "Amazon is backing Ecobee, a smart thermostat company, just days after buying Ring". CNBC. Retrieved 11 March 2018. ^ "Partnerships | Smart WiFi Thermostats by ecobee". www.ecobee.com. Retrieved 2017-05-01. ^ "ecobee now works with the Google Assistant". TheCanadianTechie. 2017-11-14. Retrieved 2018-03-14.